We are excited to welcome all local experts and business professionals to our first Flexofit Seminar in Cairo, Egypt on the 12th March 2019. This is our 25th seminar since we started out in 2015! See you in the Intercontinental Cairo on the Nile – if you haven’t booked yet, contact us through email! Flexofit Egypt Seminar was a huge success! We are very happy to report, that the Flexofit Egypt Seminar in Cairo went really well. Local top convertors and trade shops representatives enjoyed an informative and interactive day with international company representatives from Chespa, Renzmann/TCS and Esko. Latest industry news and developments in printing and packaging were presented. Also the networking around the seminar was perceived to be fruitful and generating mutual benefits. The table top exposition provided the interested audience with state-of-the-art samples and gave good grounds for technical discussions. The Packaging Newsletter and Flexoglobal featured our Seminar with a report. For 2019 we are looking forward to again holding seminars both in Africa and Asia. Our highly praised seminars are a great place to learn, network and connect with industry experts. All our events take place in world class hotels with international standard. Most seminars also feature table-top exposition with samples from leading manufacturers. All attendees receive a certificate of participation. This year for the first time seminars will take place in Egypt, on the Philippines, in Algeria and in Saudi Arabia. If you are interested in attending one of our seminars in 2019, please do get in contact with us by email or just call +49 162 88 03 888. We are looking forward to meeting you and making you fit in Flexo! When we founded the Flexofit GmbH in 2015 we were looking forward to start a great adventure – and our seminars really have become a great source of inspiration, professional exchange for us and the people who work with us and visit the seminars. In October 2015 we held the first ever Flexofit Seminar in Nairobi, Kenya and look forward to our 25th Seminar in early 2019 in Cairo, Egypt. Right now, we are planning our seminars for 2019 – and have looked back to count our achivements. In the last three years we have not only earned a ton of frequent flyer miles, but also connected with so many great people all over Africa and Asia, shared experiences and established a strong network within the printing industry. If our good luck (and our professional skills) persist, we will hold our 25th Flexofit „Silver anniversary“ seminar in Egypt next March. So right now, we are sharing the history of our seminars with you. 1. 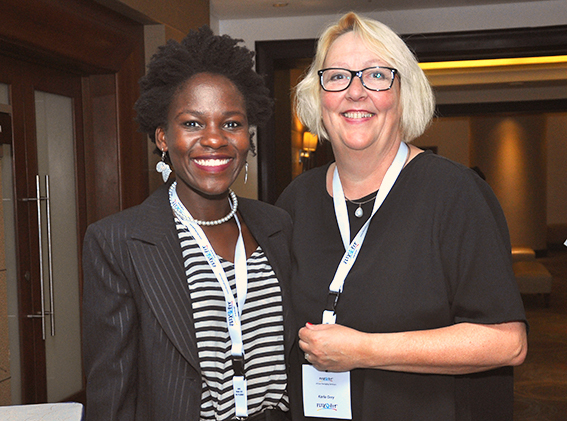 Flexofit Kenya Seminar, Nairobi 8th October 2015 – take a look! 2. Flexofit Tansania Seminar, Daressalam, 16th March 2016 see more here! 3. Flexofit Nigeria Seminar, Lagos, 25th April 2016 – see more here! 4. Flexofit Ghana Seminar, Accra, 6th September 2016 see more here! 5. Flexofit Kenya Seminar, Nairobi, 4th October 2016 see more here! 8. Flexofit Ethiopia Seminar, Addis Ababa, 2nd February 2017 – see Market Insights Ethiopia! 9. Flexofit Nigeria Seminar, Lagos, 31st March 2017 – see more here! 12. Flexofit Senegal Seminar, Dakar, 20th June 2017 – see more here – this was our first seminar that was held in French! 17. Flexofit Namibia Seminar, Windhoek, 27th October 2017 – more on these three seminars here! 2018 – adding Asia to the map! 18. Flexofit SAGA Seminar, Nairobi, 1st March 2018 – learn more about SAGA! 20. 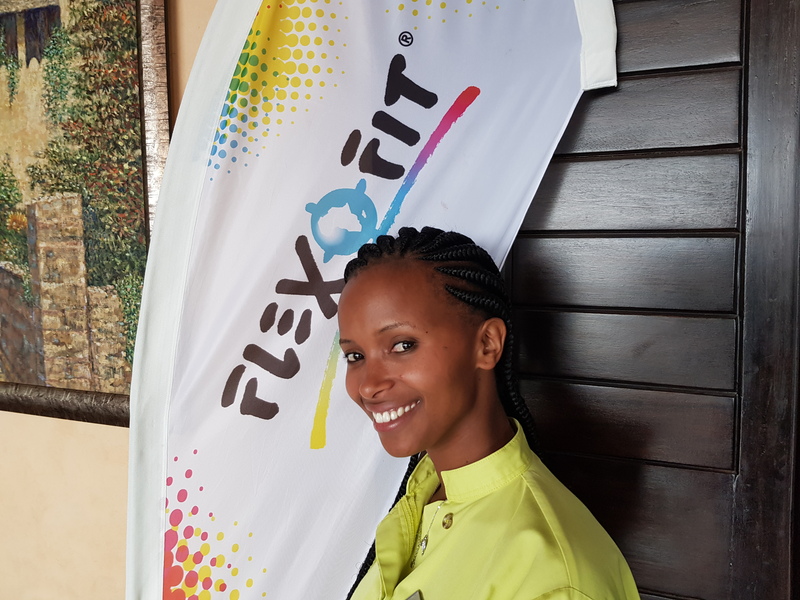 Flexofit Uganda Seminar, Kampala, 9th May 2018 – see more here! 22. Flexofit Vietnam Seminar, Ho-Chi-Minh-City, 20th June 2018 – more about the Asia Seminars! 23. Flexofit South Africa Seminar, Durban, 24th October 2018 – see more here! Milestone 25 seminars – silver jubilee in 2019! We want to thank all of you, who are with us in this adventure! It is amazing to work with people from so many countries, to meet and share and grow together. We really look forward to seeing all of you again in 2019 and the future! If you are from Egypt, the Philippines, Algeria or Saudi Arabia prepare to become part of the world of Flexofit soon! We held our first ever Flexofit Asia Seminars in Bangkok, Thailand and Ho Chi Minh City, Vietnam in June. While the flexo printing industry is developing quite well in both countries, current developments and techniques were novelties for the attending experts. On 12th of June the Thai printing and packaging community enjoyed a very valuable seminar in their capital. 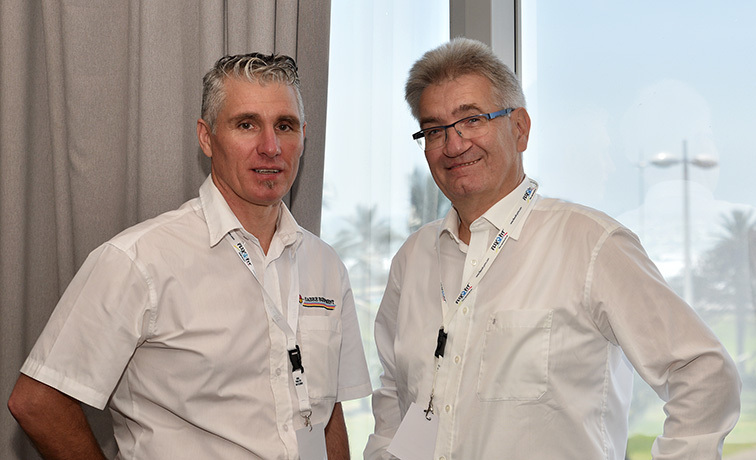 Representants from big converters and repro houses nationwide delighted in the professional talks and exchanges. The subsequently held Flexofit Vietnam seminar on 20th June turned out to host the biggest Flexofit audience ever. Over 50 participants from Vietnam came to the south Vietnamese city to listen to the international experts. Presentations were given by speakers from Esko, Chespa, Vianord, tesa and Renzmann (Huvase). The seminars covered a wide range of special topics and discussions. The attending participants highly valued the insightful information presented in the seminar and were grateful for this opportunity to meet with peers and international business partners. Also, the product samples and further information about devices that where shown in a table top exhibition proved to be of great value for the participants. 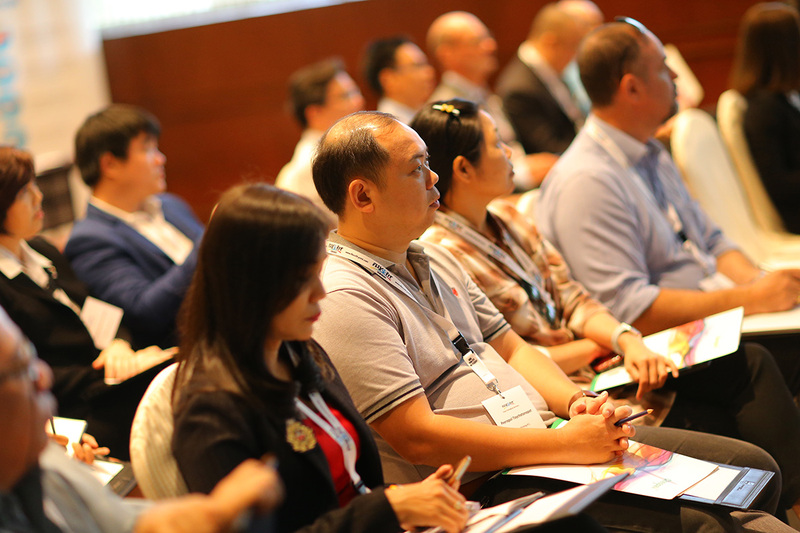 Flexo and Gravure Global and Flexoglobal also covered our Asia seminars. We held our first ever Flexofit Uganda Seminar in Kampala, Uganda on 9th May. The capital of this rising East African country welcomed us and the international speakers warmly. The local expert audience arrived from more than 14 companies in Uganda, bordering Ruanda and Kenya, as well as from far away South Africa. The attending participants highly valued the insightful information presented in the seminar and was grateful for this opportunity to meet with peers and business partners. The seminar covered a wide range of special topics and discussions: prepress, plate making, printing devices and facilities, as well as techniques and water-based solutions were discussed in addition to local challenges and specific market demands. Similar events have not occurred in Uganda before, as the availability of information and training is very limited. Also, there are only very few local distributors for consumables locally. The international lecturers enjoyed the interaction with the group and stated, that the seminars are a great way to support each other, grow together and establish new business contacts. In the near future several new printing presses will arrive and be installed in Uganda. At the same time, specialists in flexo printing are hard to find in the East African job market. For 2019 a SAGA basic training on printing techniques, materials, machinery and devices is planned in order to qualify staff and improve their skills – check this space for updates on the date! Looking for a Flexofit Seminar near you? Meet us this month in Bangkok or Ho-Chi-Minh-City. Upcoming for 2018 are also Flexofit Seminars in Yaoundé, Cameroon, Durban, South Africa, Lusaka, Zambia and Casablanca, Morocco. For more locations, get in touch. 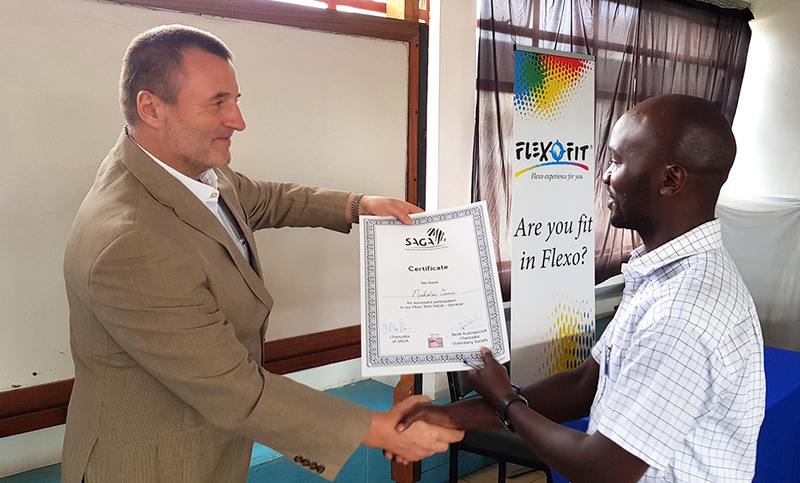 The Flexofit Uganda seminar was also featured in PrintWeek MEA, Flexo&Gravure Global, Packaging Newsletter and Flexoglobal. We are very happy to announce the great success of the first Sub Saharan Gutenberg Association (SAGA) Seminar at the Academy of Graphic Technology in Nairobi on the 1st March. Together with Chespa and KulChespa we invited operators and product managers of well-known local printing companies and repro houses to a day full of educational information.The instructive seminar ran a basic flexo training and gave an overview about printing processes, flexo prepress, flexo plates and equipment, plate mounting, ink systems, anilox rollers, doctor blades, corrugated, flexible packaging, tags and labels and die cutting. The mediated contents were very well enjoyed by all participants, who strongly asked for an advanced training from Flexofit and SAGA soon. Subsequently on the 2nd March the 4th Flexofit Kenya Seminar under the theme of “Welcome to the world of Packaging” delighted the east African professional audience, who had come into Nairobi to attend Propak the day before. 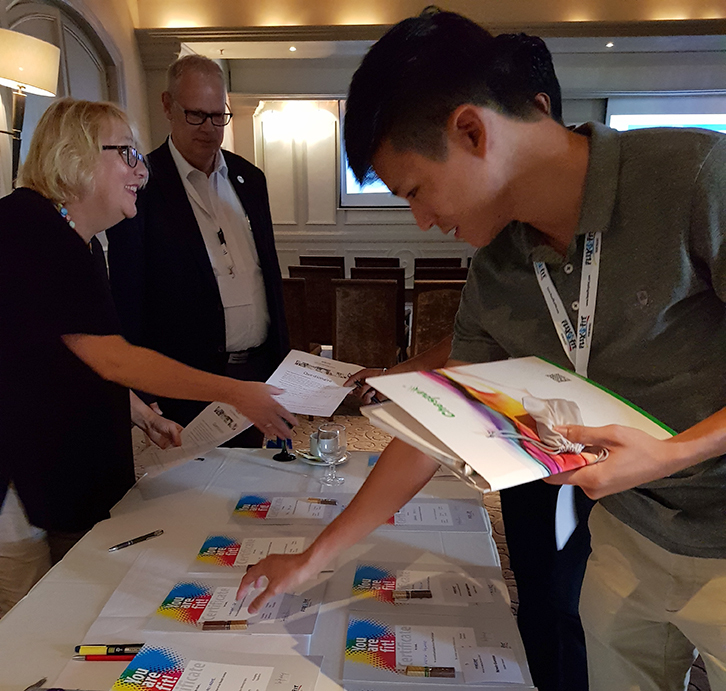 The seminar was the perfect opportunity to network, learn about new developments in the printing industry and seek inspiration from the presentations of international companies. The appreciation and high attendance of the combination of the Flexofit Seminar with the SAGA basic training once again underlines the need for further education in the emerging African markets. The international lecturers enjoyed the interaction with the group and stated, that the seminars are a great way to support each other and grow together. They are a unique way to learn basic information about flexo processes as well as latest news in the printing and packaging fields from the industry. This was also featured in FlexoGlobal. After three years of successful seminars all over Africa, the Flexofit GmbH from Germany is also hosting their first seminars in Asia. In 2018 Flexofit seminars will take place in African countries like Kenya, Uganda and South Africa as well as in Thailand and Vietnam. Our highly successful and widely known seminars bring you knowledge about flexo printing, current market insights as well as the latest developments in the industry in just one day. Participants profit from an exclusive industry network meeting and contact with international companies from Europa and the US who showcase their products and expertise. Our entry into Asia stems from intensive research and strong contacts with key partners. Furthermore environmental aspects like recycling are a topic both in the Asian market as well as with international companies, who have a great interest in and awareness of the Asia as a rising market place. The networking and exchange around our renown and highly praised seminars about specific local demands and industry communication is also a very valuable part of the seminars. All our events take place in world class hotels with international standard. Most seminars also feature table-top exposition with samples from leading manufacturers. All attendees receive a certificate of participation. If you are interested in attending one of our seminars in 2018, please do get in contact with us by email or just call +49 162 88 03 888. With three Flexofit Seminars in Port Louis, Mauritius on 20th, Johannesburg, South Africa on 24th and in Windhoek, Namibia on 27th October Flexofit answered to an ever rising demand to professional education in the printing industry in Africa. The local expert audience in all three countries delightfully attended the seminars with industry speakers from international companies like Chespa, DuPont, Esko, tesa, Renzmann and Windmoeller & Hoelscher among others. The 2nd Flexofit Mauritius Seminar after last years was well received as the interest in Flexofit seminars is increasing. 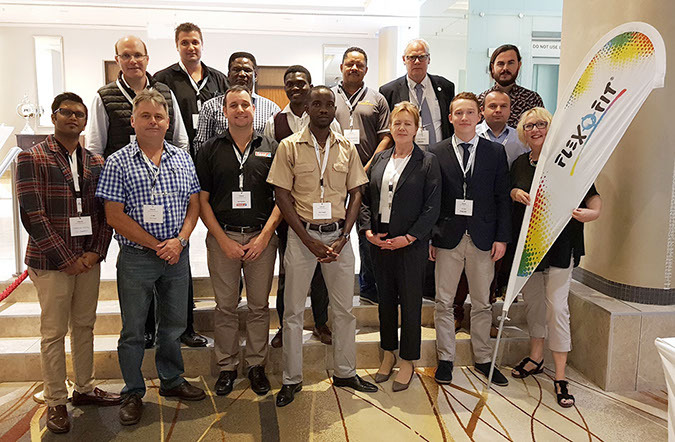 Representatives from Chespa, DuPont, DuPont South Africa, Polyflex South Africa, Toyo, Windmoeller & Hoelscher gave their presentations to the islands printing industry experts. Especially solvent and water based inks were discussed in addition to the peculiar challenges in this rather small market, where short runs in printing material are a challenge for cost efficiency and meeting market demands. In South Africa last year the first Flexofit Seminar took place in Cape Town. This year a variety of customers from the Johannesburg region met with European industry experts from world leading printing industry companies again. Esko started the seminar in Johannesburg with the presentation of Johan Bastiaen, Sales Director Africa on „Flexo simplified“. Followed by Chespa from Poland with CEO Marek Siekiera presenting the latest „Innovations in Flexo Printing“. DuPont, world leading company for photopolymer plates, continued with „Why the Cyrel* Printing plate is so important to the success of Flexo“– Gary Weyman, Sales Manager Africa gave the answer. Glen Robbins from tesa, a well-known company in adhesives, gave an interesting overview of „tesas Print and Web Processing soft print and splicing assortment“. Last presentation from Heike Beenen, Global Marketing Manager at Renzmann from Germany was „Cleaning and solvent distillation in flexo printing companies“, which is also an environmental issue. For 2018 a Flexofit seminar is planned for Durban as requested both from the international speakers as well as by many customers. The Southwest African country Namibia had a premiere with their first Flexofit Seminar ever. Also in Windhoek presentations from Chespa, DuPont, tesa and Renzmann were very much appreciated by all professional participants. The Namibian market has been growing in the last years and the international speakers wanted to get a firsthand impression of this emerging market. comments Paul Endjala, MD of Kaptau Packaging in Oshakati. At all seminars Product Samples and further information about devices were shown at table top exhibitions. The networking at the event was mutually perceived as very valuable. For 2018 Flexofit Seminars are planned to take place in Africa and Asia, watch this website – more information coming soon! 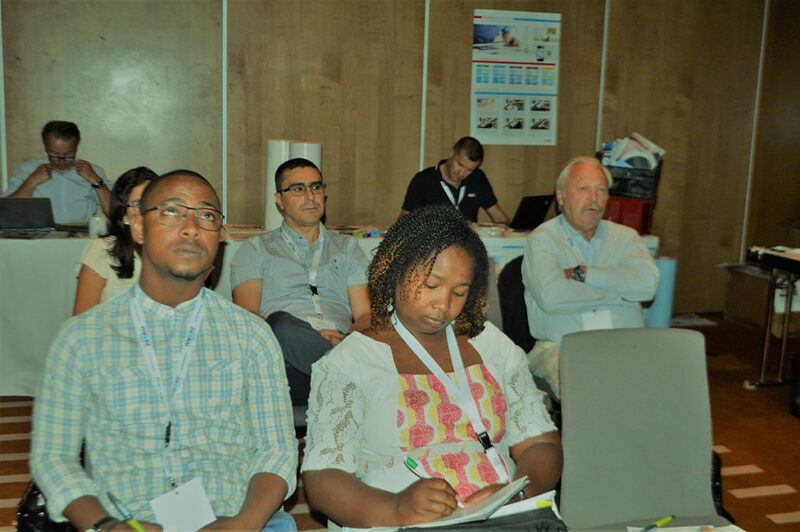 The Flexofit Mauritius, South Africa and Namibia seminars were also featured in The Gapp , Flexpack, Nigeriapackaging and Flexoglobal. For more than 2 years Flexofit has conducted seminars all over Africa focusing in English speaking nations. Now Flexofit held the first Flexofit Senegal Seminar in the capital Dakar on the 20th June completely in French. The local expert audience was delighted to learn from and meet with leading international producers. Representatives from global producers like Chespa, DuPont, Esko and Tesa met with the leading businesses from Dakar and the region. The broad audience of local industry staff, represented by top management followed the presentations with keen interest. Senegal is a sub-Saharan country in West Africa with its capital Dakar being the most westerly city in Africa, surrounded by the Atlantic Ocean. French is the official language for the 14.3 million people living in Senegal, who mostly speak the local tongue Wolof. 95.4 percent of the population swear to the Muslim faith. Special topics and discussions in the seminar included prepress, plate making, printing devices and facilities, as well as techniques and waterbased solutions. The market conditions in Senegal were also broadly discussed, and it turned out, that producers with limited access to market knowledge might perceive, that there is only one big player on this market. If you look closer, there are several companies that compete for the increasing demand for customized packaging materials in the Senegal. The audience as well as the speakers were very pleased with the discussion and exchange of knowledge at the seminar. The next Flexofit seminars in 2017 will take place in Ghana and Côte d’Ivoire in September. In October Flexofit Seminars will visit Mauritius, South Africa and Namibia.